This Clarke Focus II MicroRider automatic floor scrubber is a smaller rider scrubber that does a great job in medium to larger sized facilities. It can be configured to use rotary style brushes/pads, or with 14" x 28" pads with the oscillating Boost® technology deck. Many different brush and pad combinations are available for varying levels of scrubbing and stripping in grocery stores, warehouses, automotive dealerships, hospitals, and more. Clarke backs this Focus II auto scrubber is backed by a great warranty, leaving you with peace of mind that this machine will do what you need it to and will hold up over time. When configured to used two 13" pads and/or brushes, this machine excels in wide area scrubbing. When configured with the 14" x 28" rectangular oscillating Boost deck, it does a great job of chemical free stripping and scrubbing. However you want to order this Focus II MicroRider, it comes standard with 4 (6V) batteries, an onboard charger, and pad drivers (two 13" drivers on the disc & one 14" x 28" driver on the Boost). For other options including maintenance free AGM batteries, chemical mixing system, or different material squeegee blades, please give us a call at 888-722-5508 so we can provide a custom quote. The squeegees that comes standard with the machine are made from polyurethane and are great for picking up water and leaving floors bone drying for smooth finished floors. This rider scrubber ships for free from our location to any commercial address in the continental United States. 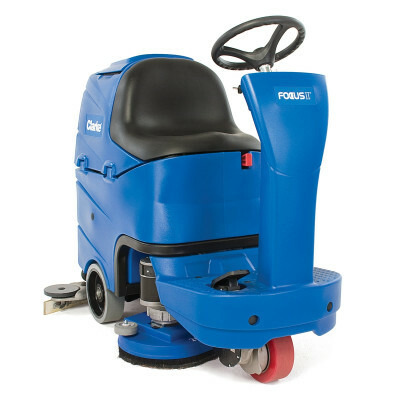 If this unit is little small for you scrubbing needs, please feel free to take a look at our full line of rider scrubbers, which includes more Clarke units, like the standard Focus II Boost automatic ride on scrubber. Can be configured with a normal rotary scrub deck (two 13" pad drivers) or a Boost scrub deck (14" x 28" rectangular driver). Boost technology uses up to 70% less solution, extends pad life by up to 40%, provides longer battery run times & cuts labor time. Unique deck automatically moves in line with the path of the rear squeegee when turning for 100% water recovery. Comfortable driver compartment with customizable features for ease of use for all operators. Four 6 volt wet batteries & a 21 gallon solution tank provides up to 3.5 hours of continuous scrubbing. Customers who were interested in the Clarke® Focus® II MicroRider™ Auto Scrubber were also interested in the following items. This is a review for the Clarke® Focus® II MicroRider™ Auto Scrubber.